The glucose clamp is a method for the determination of pharmacokinetic and pharmacodynamic (PK/PD) effects of anti-diabetic drugs (e.g. insulin) where the blood glucose (BG) concentration lowering effect is antagonized by variable glucose infusion rates (GIR). For the determination of pharmacokinetic and pharmacodynamic (PK/PD) effects of new insulins and other anti-diabetic drugs exists a gold standard: the euglycemic, hyperinsulinemic glucose clamp. 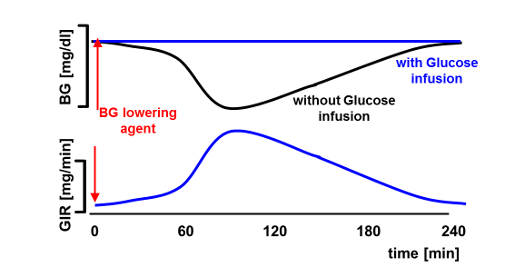 In a typical glucose clamp experiment is infused glucose at a variable rate, so that BG is "clamped" at a pre-determined target level. Thereby a drug-induced decline in blood glucose (BG) concentrations is prevented. Thus, the glucose clamp is designed as a closed-loop system where BG is measured frequently. 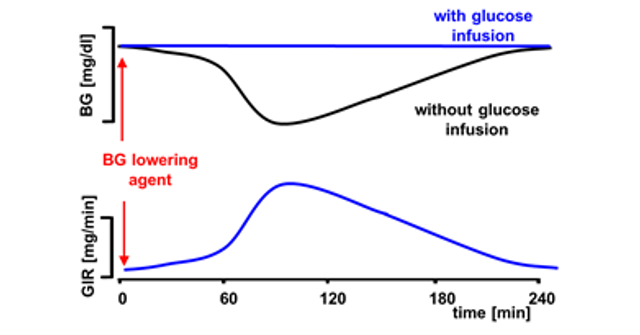 The two major factors for determining glucose infusion rates (GIR) are considered as the changes in BG and deviation of BG from the target level.